Sign up now to stay up-to-date on Petra and this website. The newsletter is available in English, Español, and Deutsch. This album brought more change for Petra. It was the first praise album they'd done in nine years, and recent additions Cooper and Lichens, as well as bassist Ronnie Cates all departed. Kevin Brandow, Pete Orta, and Lonnie Chapin came on board. 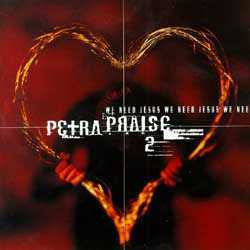 This has some cool arrangements, and I love the way all the praise songs turned out. Bob Hartman made the most of his time after he stopped touring. He wrote three excellent songs, especially "Lovely Lord." See that we need Jesus? Jesus is the Son of man?